Tarun and Yogita's Travel Blog: What else in Rajasthan? certainly not to be missed, Udaipur, the Venice of India. And try staying at a modest guest house and you may never know you might be taking care of the baby in the host family or become friends with the friends of your host family. And while you are in Udaipur and have done whatever many guide books say don't miss the 7 pm dance show at the Bagore ki Haveli. In a small program they introduce you to the exuberance and the joy for life every Rajasthani female has in abundance. The hardships of a life in desert are a nonentity when they sway with the tunes of the vibrant Rajasthani folk music. 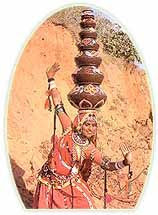 And watch the program till the end as it ends in an exotic, courageous and a tremendously poised dance by a female who can sway her whole body in motions, even when she's on top of broken glass and not drops even one of the nine pots she is balancing on her head.